The date is 1966 of the Galactic Era, almost three thousand years from now, and the Republic, created by the human race – but not yet dominated by it – finds itself in an all-out war. They stand against the Teroni Federation, an alliance of races that resent Man’s growing military and economic power. The main battles are taking place in the Spiral Arm and toward the Core. But far out on the Rim, the Theodore Roosevelt is one of three ships charged with protecting the Phoenix Cluster – a group of 73 inhabited worlds. Old, battered, some of its weapon systems outmoded, the Teddy R. is a ship that would have been decommissioned years ago if weren’t for the war. Its crew is composed of retreads, discipline cases, and a few raw recruits. But a new officer has been transferred to the Teddy R. His name is Wilson Cole, and he comes with a reputation for heroics and disobedience. Will the galaxy ever be the same? There’s a light serialized feel to Starship: Mutiny, and I just don’t mean it’s the first in a series. There are distinct but successive adventures in this novel, rather than one over-arching plot. I like that a lot. I can’t say that Resnick’s broken any new ground, but what he does is bring an immediacy and intelligence to the Military SF sub-genre. Resnick is a master of dialogue and banter, his plots are fleshed out almost entirely by character interaction. Even scenes where Wilson Cole (the lead) is alone play out in an inner-dialogue. It makes for a quick compelling listen. The emotional roller coaster, so often present in Resnick short stories, is absent; but all the gravitas of his intellectual legacy informs the action. It’s as if SF’s own Tolstoy were writing Horatio Hornblower by way of The Odyssey. Audible Frontiers, when possible, gets authors to introduce their work. 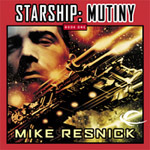 Here it means we get insight into the motivation to write Starship: Mutiny from Mike Resnick himself. This is Resnick’s first Military SF book, and about that sub-genre he says: “I found a lot of it very same, filled with endless descriptions of military tactics and blood ‘n gut heroics. And that didn’t interest me at all. I’m much more interested in leadership than tactics. I’ve always prized intelligence more than physical force.” And that’s what is delivered. The narrator, Jonathan Davis, best known for his many Star Wars audibooks, is a familiar voice in this genre. Spaceship battles, alien accents and technojargon flow easily into the microphone. The whole novel took me less than 36 hours to consume, its highly addictive listening and I confess I was downloading the follow-up book before I’d even finished this one. For a novel so light in ideas, the heart of SF, it’s hard to call it “unmissable,” but on the other hand it masterfully achieves precisely what it intends to; it’s intelligent and entertaining Military SF – and that is still no small feat. Starship: Mutiny: Highly recommended!